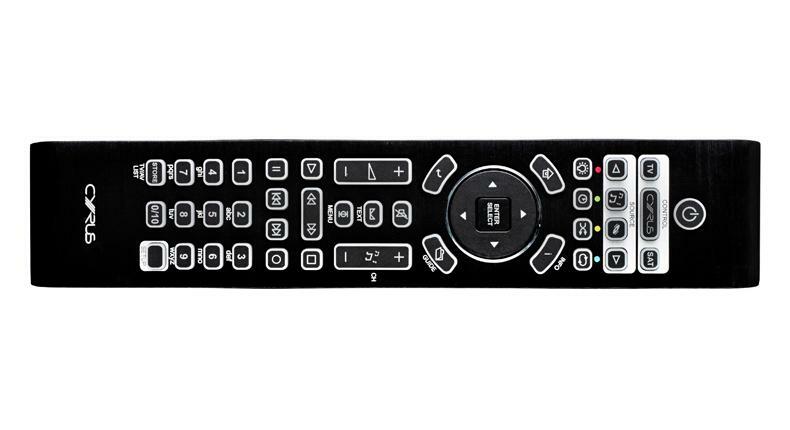 "We're hugely impressed with the CD i and are confident you won't find a more entertaining, more revealing player without spending closer to £1500. 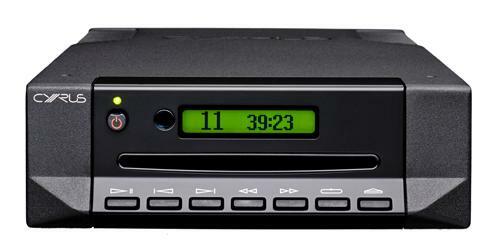 For its dynamic expression, rhythmic ability and, above all, ability to entertain, the CD i holds on to its Award." 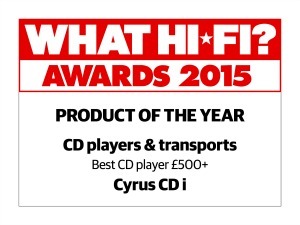 CD i -- What Hi Fi? 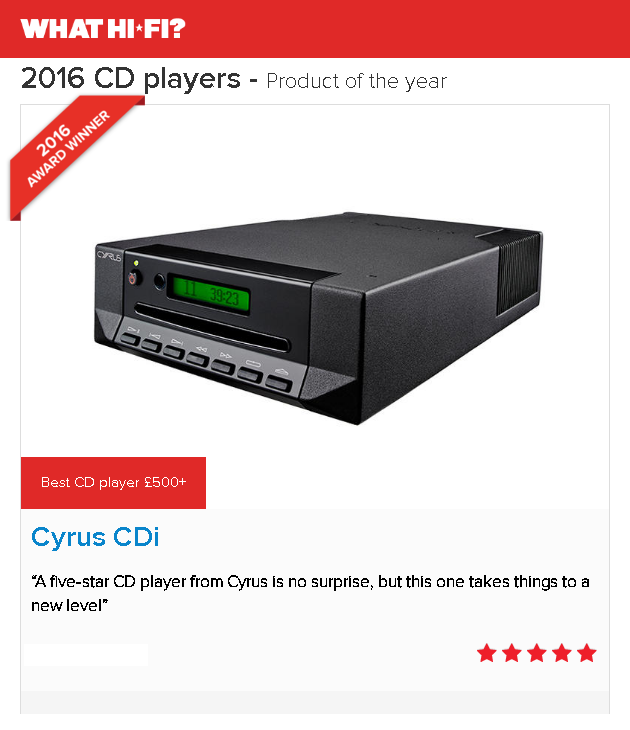 Sound and Vision Awards 2015 "Best CD player £500+"
"A five-star CD player from Cyrus is no surprise, but this one takes things to a new level." 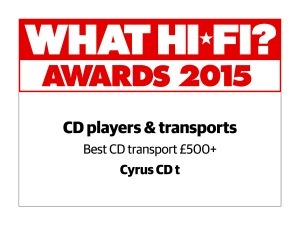 CD t -- What Hi Fi? 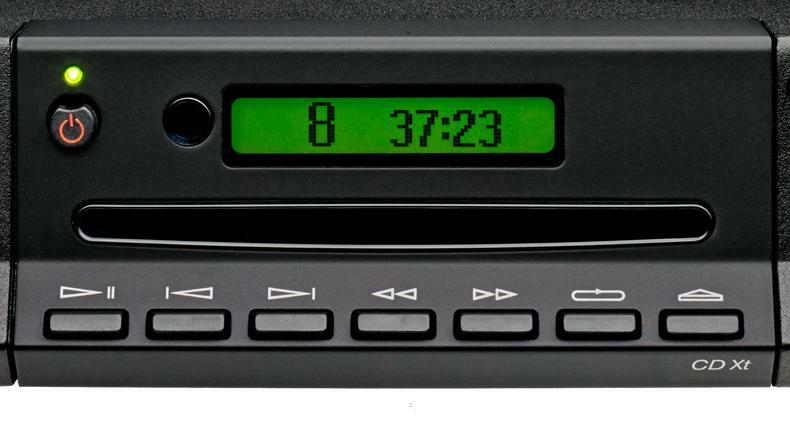 Sound and Vision Awards 2015 "Best CD transport £500+"
"Superb, near-faultless performance - this is a remarkably talented and enjoyable CD transport for the money." 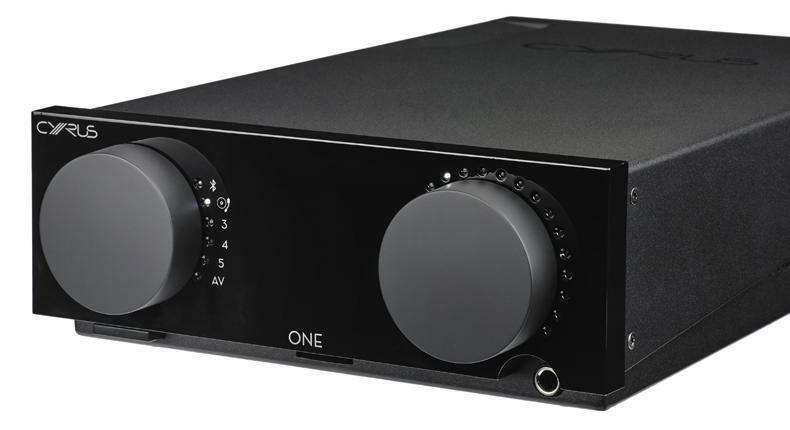 The Signature sounds cleaner, crisper and more dynamic, even compared with its predecessor partnering a PSX-R.
Each instrumental strand is crisply drawn, notes stop and start with precision, and subtleties, such as the dense texture of the growling low frequencies and the space around the sparse instrumental backdrops, are easy to hear. The soundstage is open and wonderfully expansive. The imaging is stable, focused, and layered with great care. We’re also impressed by the combination’s wide-ranging dynamics; the way the soundtrack’s seismic bass hits hard but also the nuanced rendering of the piano and string notes. It’s the kind of performance we’d find hard to better even at double the money. It sounds less stressed, less brittle and more like an organic event before your very ears. 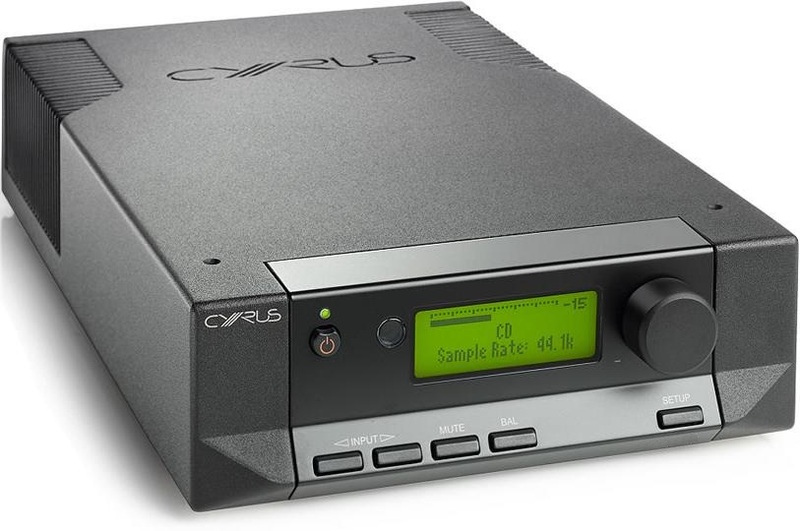 Indeed, this really defines the Cyrus; it has a sense of ease that simply doesn’t sound like digital. The music flows organically, rather than coming over as forced or artificially enhanced in some way. Treble is excellent too, being crisp and smooth and well extended. Again, it’s amazing how a transport can change the ‘feel’ – if not the actual tonal balance – of the high frequencies. It’s an awful lot to spend on ‘just’ a transport, but I have never heard anything that comes close at this price. 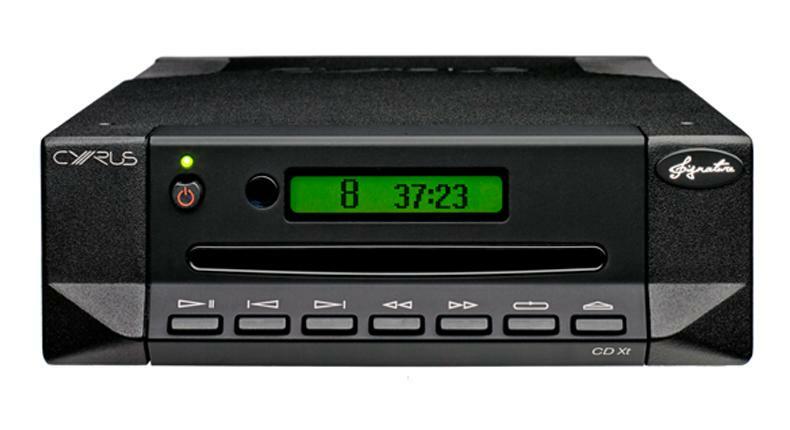 We played Hans Zimmer’s Dream is Collapsing from the Inception soundtrack and right away the CDi displayed the uniform, articulate and intuitive presentation that we’d expect from a more expensive player. Offering buckets of detail, the finer flurries of quieter instruments surfaced, while the more intense parts of the score soared into a dramatic climax. Each layer of the composition was precisely unpeeled, and each instrument passed through the mix with coherent flow and tact. But the rhythmic talent here is what really raises our eyebrows. Pace and momentum is exercised with articulation and vibrancy. 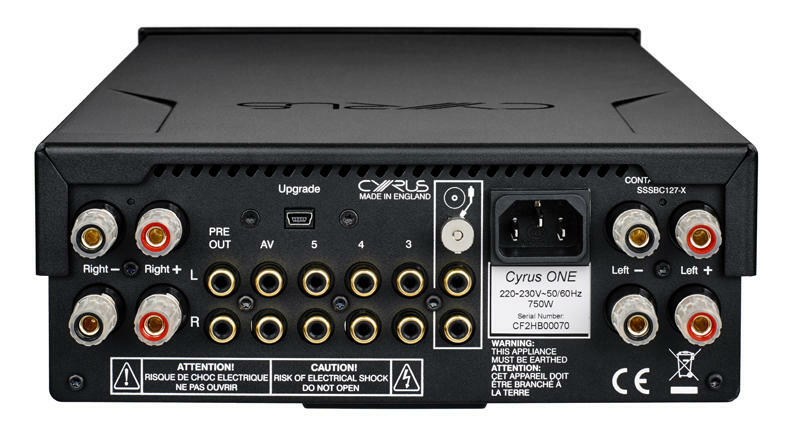 We found ourselves entertained by the Cyrus’ dynamic agility and neutral balance in a way that’s rare at this price. 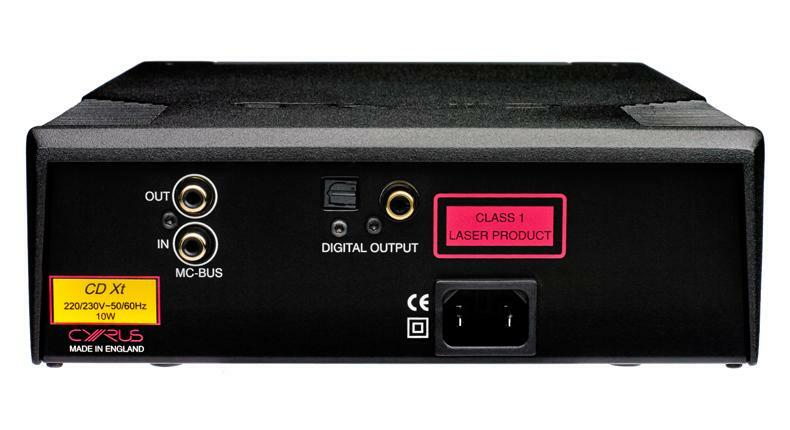 As if that weren’t testing enough, we dug out a live recording of Linkin Park and were equally impressed at the amount of clarity and definition it extracted against the background crowd noise – even if the spacious soundstage seemed a bit forsaken. Eminem's Marshall Mathers LP 2 is a hard-sounding album, but this Cyrus takes it all in its stride. 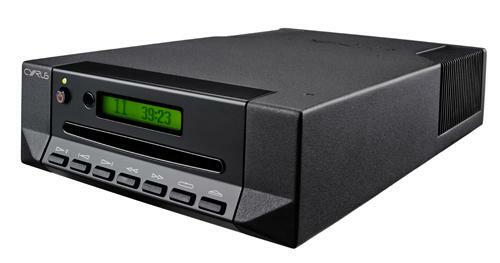 The presentation has greater weight and low-end authority than its predecessors, but it's the CDi's way with rhytms that really catches our attention. It's dazzling expressive, capturing the changes of pace and momentum superbly. Move onto Tchaikovsky's 1812 Overture and w're taken by the Cyrus's dynamic reach and its ability to keep track of delicate musica strands when the piece gets busy. 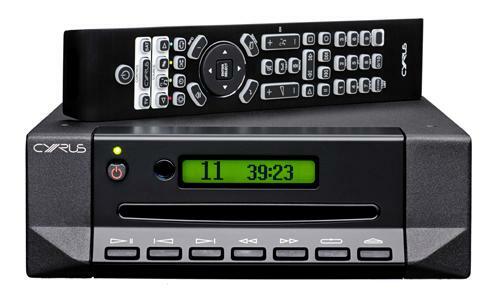 The CDi is an exceptional player that's as insightful as it is entertaining. 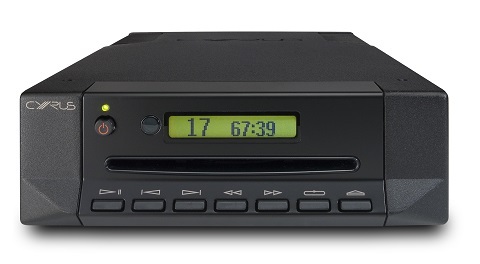 The CD t is a pure CD transport system. 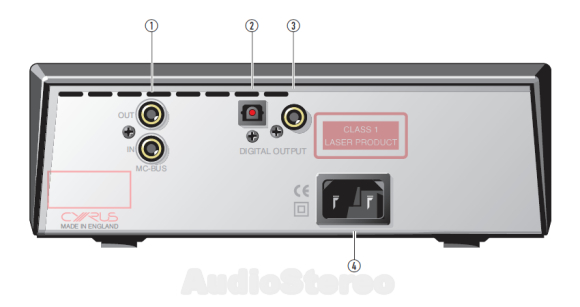 Two digital outputs: Toslink and SPDIF. Low resonance, die-cast aluminum chassis. 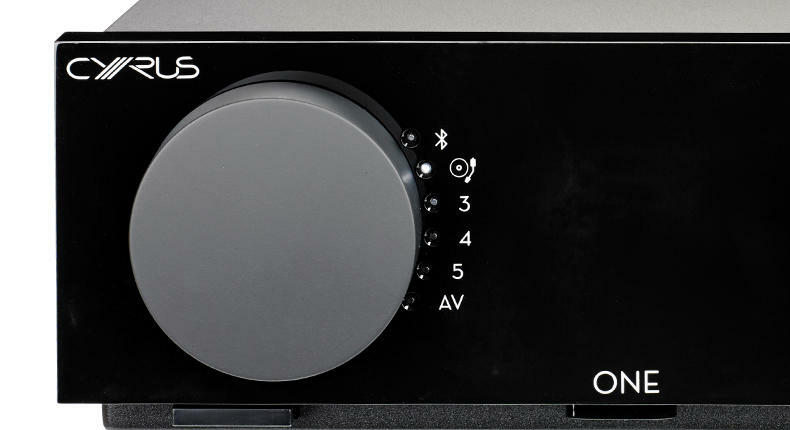 Partnered with a DAC X+ or DAC XP Signature the CD t will deliver ruler-flat linear performance across the sonic spectrum, vanishingly low background noise and class leading jitter rejection, out-performing most integrated CD players. The CD t features our unique Servo Evolution ‘CD Engine’ matched with close tolerance components that together deliver remarkable performance for its price. 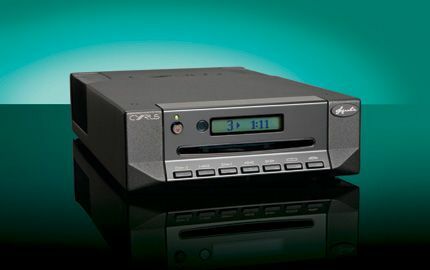 Although the CD t uses a simpler power supply (a single power transformer, rather than the twin transformer arrangement of the CD Xt Signature) CD t does have a multi-regulated power section that allows the player to extract extremely high levels of data from CD’s, and importantly, with industry leading low read error rates. Carefully chosen premium quality laser and associated electromechanical sled components are further mechanically isolated to allow our in-house developed ‘Servo Evolution’ software to control the microscopic laser and motor movements that allow the unique Cyrus CD platform to be the best CD ‘engine’ in the world.